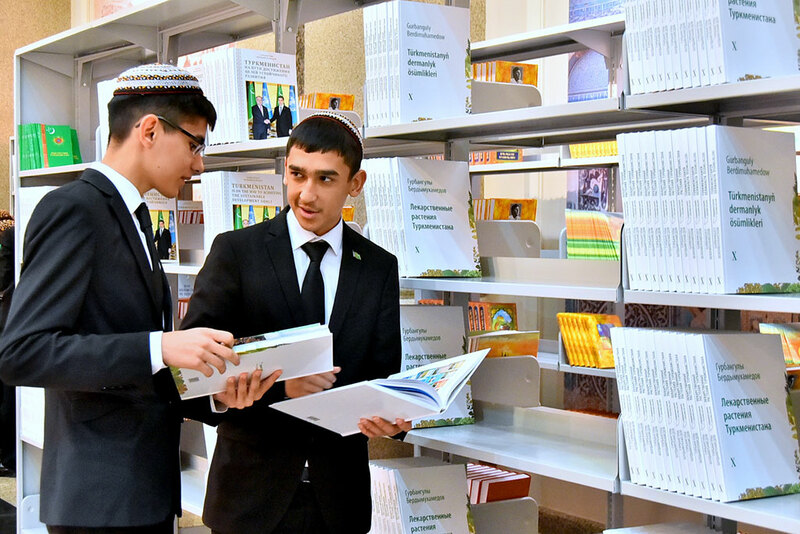 Turkmenistan is hitting the books. In the days of the late President Saparmurat Niyazov, who died in 2006, libraries were deemed something of an unneeded frippery. So much so that the erratic leader once ordered the closure of rural libraries, insisting that village folk had no interest in reading. His similarly mercurial successor, Gurbanguly Berdymukhamedov, is taking his whims in another direction. Following a visit to the State Library on November 7, during which, as state media put it, he familiarized himself with the “development of a central library system,” he has become infused with a refreshed passion for the written word. As if to convey this rediscovered love for print, it was announced at the weekly meeting that the State Publishing Service fulfilled its plan by 134.3 percent, whatever exactly that means. Visitors to the library can be certain to find at least one author’s output in the stacks. Followers of Berdymukhamedov’s works will already know that he is prolific writer. By the estimate of the exile-run Chronicles of Turkmenistan, he has penned more than 40 books since taking office — amounting to one every four months or so. Talk in Cabinet also dwelled on the financial books, which were said to be “satisfactory in general.” But as ever, this rose-tinted narrative was undermined by the president’s grumbling. This week, Berdymukhamedov took a pop at state chemicals company Turkmenkhimiya, and more specifically at its failure to fulfill expectations at the Belarusian-built Garlyk potash fertilizer plant. This enterprise had been Ashgabat’s great white hope for diversifying away from natural gas, but it appears that the project was not actually executed to completion, leading to crushingly disappointing output figures. A distressing sub-plot to this affair is that it had soured relations between Turkmenistan and Belarus – usually highly amicable authoritarian brothers-in-arms. But last year, Minsk declared it would not take part in Ashgabat's efforts to build a second potash plant in Karabil in Lebap province, claiming Turkmenistan had not settled its debts for Garlyk. Berdymukhamedov has now ordered his government to file international arbitration proceedings against Belgorkhimprom, the Minsk-based company that did the work on Garlyk. Turkmenistan is becoming quite the habitué of international arbitration hallways as it is currently embroiled in awkward disputes with companies from Iran, Turkey, Cyprus and Germany. Government-friendly media has dutifully ignored flies in the ointment and reported news that is glowing only upon superficial scrutiny. Orient News noted that Turkmen farmers are set to receive 800 Turkmen manat per ton of wheat, double what they receive now. At the official exchange rate of 3.51 manat-to-the dollar, this amounts to nearly $228. But if the calculations are done according to the more realistic black market rate – somewhere around 20 manat to the dollar – that translates into a mere $40. International market prices for wheat are just above $210 per ton. Another government-friendly outlet, SNG Today, reported that the privately owned Bereketli chain had opened 20 grocery stores in Ashgabat this year and plans to open 10 more outlets. There was no mention of the shortages that have blighted Ashgabat stores in recent months. But as the Chronicles of Turkmenistan website, based in Vienna, has documented in videos, bread lines have become a thing in the capital. At times, the state’s information machine contradicts itself. In one such case, SNG Today, which operates out of Moscow and discloses little about itself but appears to be a clearing house for pro-regime news, stated on November 10 that cargo turnover at Turkmenbashi port had exceeded the plan for the first nine months of 2018. And yet, Berdymukhamedov was carping only last month that the state-of-the-art seaport, which opened in May, was operating below capacity. The government will not admit the economy is creaking, but there are clues aplenty. RFE/RL's Turkmen service, Azatlyk, reported on November 11 that state employees in Balkan province have still not received their wages for October. The Chronicles of Turkmenistan also noted delays in pension handouts in Dashoguz province. One long-looming structural remedy for budget shortfalls is the imminent suspension to handouts of utilities and basic goods. According to Azatlyk, the government is now installing gas meters in Ashgabat homes at residents’ expense. The process has reportedly become mired in confusion and corruption. On a more promising front, Chinese oil major PetroChina on November 12 announced that the China-Central Asia gas pipeline would operate at full capacity this winter – a first. And on November 5, CNPC declared that it had put into commission four compressor stations at the Samandepe gas field, part of a production-sharing agreement territory called Bagtyyarlyk. Perhaps the most intriguing energy news of the week came out of an oil and gas conference in Abu Dhabi. One delegate was Turkmen energy industry veteran Yagshigeldy Kakayev, who told Russia’s TASS news agency that Turkmenistan is in talks with the European Commission on potential future deliveries of gas to Europe. “We are engaged in active negotiations with the European Commission and other transit nations on this issues. We are not just sitting on our hands,” he was quoted as saying. Sure enough, Turkish Foreign Minister Mevlut Cavusoglu was in Ashgabat on November 9 for talks that seemed to have been focused on a putative Trans-Caspian Pipeline, the most politically reliable route for Turkmen gas to reach Western Europe. Cavusoglu also met with Berdymukhamedov during his visit. Turkmen-Turkish ties are underpinned by kinship and some shared commercial interests, but the circumstantial evidence points to a residual wariness. On November 12, it was reported that Turkey had increased the amount of time that Uzbek, Kazakh and Tajik citizens could remain visa-free in the country up to 90 days per 180 days. Turkmen citizens are still allowed only 30 days. Turkmenistan is still trying to follow up on Berdymukhamedov’s United States tour to drum up investment. On November 11, Orient reported in vague terms on a memorandum of understanding between the government and U.S. agricultural-machinery manufacturer John Deere on future cooperation. In other Washington-tinged news, Ashgabat appears to be yielding to demands to enforce sanctions on Iran. The opposition-linked Gundogar website claimed this week that Turkmenistan has closed its airspace to sanctioned Iranian airline company Mahan Air. **Correction: This post originally reported that Uzbek, Kazakh and Tajik citizens could stay visa-free in Turkey up to 90 days per year. It is per 180 days.